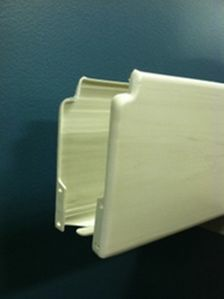 This is Haworth's Original Line of Cubicles which utilizes a plastic "hinge" system. Both the Unigroup and Places lines are interchangeable in many aspects. The primary difference in these two lines is that Unigroup offered several different power options, all using the base cavity for all power and data. The Places line only comes in one power option and has a double cavity in the panel (in the base and on top) for all data and phone lines. Please call 832-539-2240 for more information.